What's up guys, dycaite, back again (finally, right?) and straight off the bat I wanna give a big thanks to kobo for filling in for me on the previous two notice board posts, much appreciated, dude! 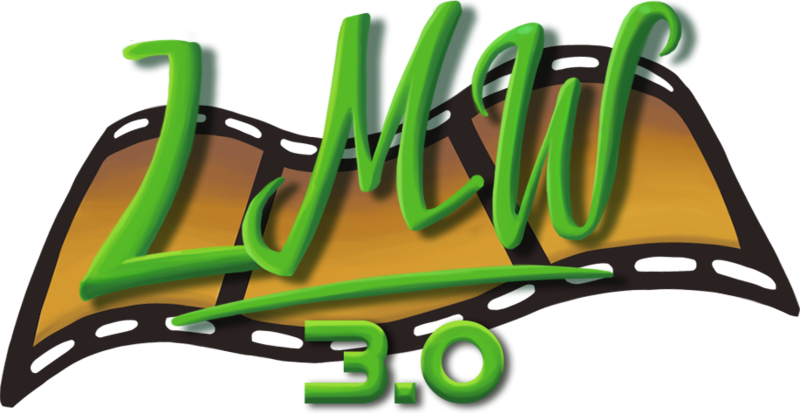 Well, it's rolled around to that time of year again, the anniversary of the LMW! 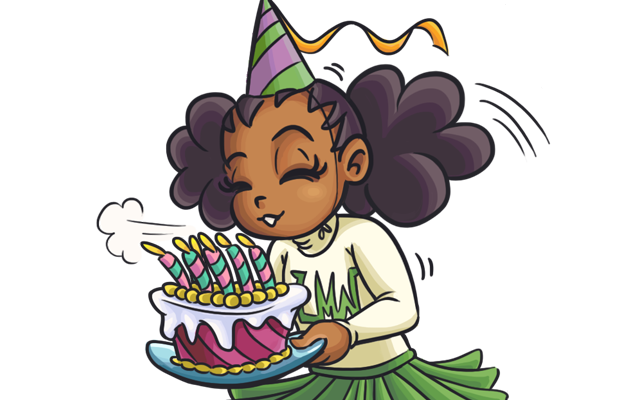 I know, I know, we're a few days past the 30th of November, but y'know what they say, "better late than never" ^__^' Big, big thanks to everybody who has contributed to the site and the community over the past 6 years, I've said it before, but I'll say it again because it's true - the LMW wouldn't be what it is today without you guys, so, from the bottom of my heart, thank you all :) Happy 6th anniversary! A lost episode of Oswald the Lucky Rabbit has been partially found! Over in Japan, a 16mm home copy of "Neck 'n' Neck" (cut down to two minutes from its original runtime of five) was found to be in the possession of anime historian Yasushi Watanabe, having purchased it during his high school years, at a toy shop near his home in Osaka, nearly 70 years ago. Watanabe learned of the cartoon's significance after reading David Bossert's 2017 Oswald the Lucky Rabbit: The Search for the Lost Disney Cartoons; it is currently being held by Kobe Planet Film Archive (one of Japan's largest private film collections) and there are reportedly talks of the short potentially being screened for animation scholars at an event in Los Angeles. Whatever the case may be, here's hoping it's made available to the public soon! You can read more about it here and here. 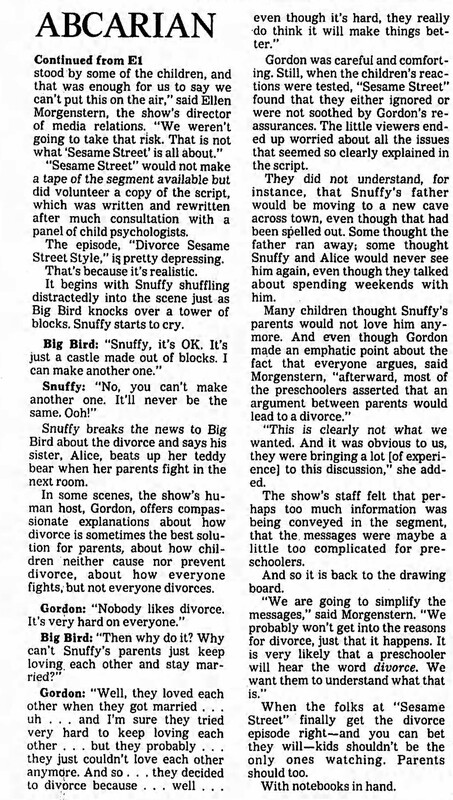 Collaborator and long time supporter of the LMW, blameitonjorge recently came across a newspaper clipping from the March 27, 1992 issue of the LA Times, featuring some official dialogue from the lost "Snuffy's Parents Get a Divorce" episode of Sesame Street! The clipping in question can be found here; thanks Jorge! 50 seconds of previously lost footage from King Koopa's Kool Kartoons has emerged! Found by YouTuber Neeel, the footage from the show's 1989 Thanksgiving marathon was made available on his channel back in August, and can be seen via the above embed! While 50 seconds might not seem very significant to some, with a show as rare as this, every little bit really does help; thanks Neeel! YouTuber and LMW contributor SSTEAS recently came into possession of a very rare promotional Pepsi Sampler PS1 disc from 1997 that was never made commercially available, and of which not even a single image of the slipcase was available online - until now! SSTEAS has graciously scanned his copy and provided the scans in a video on his channel, you can check it out via the above embed; thanks SSTEAS! YouTuber Eclipse of Fire Productions has recently instigated an effort to have the lost "Am I Beautiful? Kuchisake-onna" episode of Ghost Stories released; this project, dubbed #FinishTheStories, is the kind of initiative I like to see in campaigning for forgotten pieces of media to be unearthed by their respective creators and as such, I figured I'd give Eclipse of Fire Productions and their #FinishTheStories project a shout out here. You can watch a video on the initiative via the above embed! That's gunna do it for today, guys! Once again, a big, big thank you to everyone who has made this place what it is over the past 6 years, I truly am immensely grateful. Here's hoping for another great year of LMW over the next 12 months; until next time, cyas! Clip from "This Is Your Life, Bear!" Hey, wake up. Listen closely: can you hear me? You need to snap out of it – you’ve been in a coma for 3 months. Oh, wait, that was me. Yeah, once again, sorry for the huge delay. No excuses. But it’s here now, and that’s the important part, right? Sure, let’s go with that. First off: our collaborators have new videos out! Bedhead Bernie has a video on Guillermo Del Toro's cancelled adaptation of Pinocchio, blameitonjorge has a video detailing 13 lost horror films, and LSuperSonicQ has 3 new lost media videos about the cancelled Chowder TV movie, ABC’s Dot Comedy, and the infamous Wicked Witch episode of Sesame Street. Be sure to check them out above! First, an absolutely MASSIVE find: user "21GunShow" (a.k.a. The New Number 2) has ripped 9 DVD-R discs of Cinematech and 13 DVD-Rs of Cinematech: Nocturnal Emissions, totaling 90+ episodes of each. They can be downloaded here and here, though be aware that they total more than 100 GB. The first episode of BrainRush has been found by DanTheDeer. The pilot for Captain Sturdy has been uploaded in its entirety to Adult Swim’s website. I-10: The Ben 10 User Generated Experience was uploaded to Vimeo by Larry Morris; he took it down, but it was mirrored here. A clip from the 1999 pilot of Dora the Explorer was discovered by LMW user InfiniteGates on Funline Animation’s website. All of the previously lost episodes from season one of All That have been uploaded by Discord user Moiisty (except for “A Few Good Men”, which is still incomplete), as well as Season 6’s “Music and More Backstage Pass”. They can be downloaded here. 4 of the 6 VHS-released episodes of Nick News with Linda Ellerbee have been uploaded to torrent tracker Myspleen by user blockhead. For those who don't have an account there, they have been mirrored to archive.org here. Two more episodes of Bear in the Big Blue House have been found: “Lost and Found” (found by FE51012), and the series finale “This is Your Life, Bear!” (found by Sam Alcumbrac). Six previously lost episodes of Welcome to Pooh Corner have been found: “Safety First”, found by Shroomy; “Tigger Takes a Fall”, found by VanceTheVHSGuy; “The Long, Long Walk”, “Day for Knights”, and “Clouds”, all found by CDCB2; and “Pooh Borrows Trouble”, found by Discord user ScreamingAllTheTime. A prototype copy of Michael Jackson’s Moonwalker for Sega Genesis, containing the cut song “Thriller”, was obtained by Reddit user Oliade677 last year. Recently, the ROM has finally been dumped by Landon White here. One of the prototype betas for the PlayStation port of ‘Superman 64’ (1999-10-29) has been found and uploaded to Archive.org by user dizzzy. There have been a lot of 3D Groove-related finds – too many to list, but at least 13 new games have been found by TOMYSSHADOW, and one game was found by Parapadarappa333. You can find them in the usual MEGA folder. We announced last year that Netflix obtained the rights to Orson Welles’ unfinished film The Other Side of the Wind. As an update, their restored and completed version has finally been released on their service. Another track from the 1993 Stone Sour demo tape has been uploaded by Ivan Contreras: “Surgery”. TropesAreDangerous has ripped 3 tapes for The Adventures of Snelgrove Snail, containing 6 previously unseen segments, 2 previously seen segments in higher quality than before, and one of the TV specials. The same user, TropesAreDangerous, has also uploaded rips of 11 VHS volumes of Once Upon a Tree. 2 other episodes have also been found by discord user npc, which means the series is now completely found. Another episode from the 1955 series The Adventures of Noddy, "Noddy's Taxi", has been found by YouTube user horipet. A new compilation tape of M3D has been ripped and uploaded by TonyFunStuff. The original music video for DJ Jazzy Jeff & The Fresh Prince – “A Nightmare On My Street” has finally surfaced. Uploaded to YouTube by user “Nancy Thompson”, this one actually made international news! That’s it – really, finally. To say it again: THANK YOU to all the aforementioned people! Gonna go back into my cocoon for a while now. So long, dear friends! A note from dycaite: Sorry about the custom forums link being inaccessible for the past few days, ProBoards changed how their DNS settings worked - back up and running now. Buenos días, muchacha latas, it’s about that time again! As there is no dilly-dallying allowed in this household, let’s jump straight to the big news – we’ve got some new video collaborators on board! You probably already know them, but give a warm welcome to blameitonjorge, LSuperSonicQ, and Bedhead Bernie! From now on their lost media videos will be featured on the new Collaborators pages, as well as in future announcements and notice board posts. All of them are very talented at what they do, so be sure to check them out if you haven’t already! First off, a pretty major one (in my opinion) – a copy of the long-lost Osamu Sato VCD The Esoteric Retina finally popped up in the form of an eBay auction, and user Swazaaa managed to grab it and put its contents online for all to see. The final bid came in at $717 USD, so let’s give a huge, HUGE thanks to them and the rest of the Osamu Sato community for pulling this together! The videos can be seen above on his YouTube account, or a full disc image with scans can be downloaded here. After years of being completely lost, the entire English dub of the 1993 anime series The Bush Baby has been uploaded by YouTuber Azunyan! Reportedly, it was one of their favorite shows as a kid in the 90s, so their mom had worked tirelessly to get all 40 episodes recorded on VHS so they could still watch it years later – impressive foresight, to say the least. Major thanks to them for taking the effort to share their childhood with the rest of us! Four episodes of the lost sitcom 13 Queens Boulevard have been uploaded by LMW user gilblitz112/Mitchell's Archive! These are the first full episodes from the series to surface, so big thanks to him and his acquaintance for supplying him with them! Out of nowhere, programmer Les Bird discovered the source code for Codename Kids Next Door: Operation B.E.S.T. in his archives and found a way to get it running in an offline state. He uploaded 2 videos of gameplay before uploading the game to his website, so big thanks for doing that dude! We appreciate it. Volume 4 of the obscure VHS series M3D has been ripped and uploaded by LMW user TonyFunStuff. It can be viewed here. Thank you! The 2002 mobile game Munkiki's Castles has been technically found for over a year now, but it’s been completely inaccessible as there were no emulators capable of running it. Well, not anymore! After a May update, the emulator FreeJ2ME is now fully able to emulate the game, officially closing this case. Another episode of the elusive puppet series Welcome to Pooh Corner has surfaced! It can be viewed here, thank you to Donut Smasher for uploading it. LMW volunteer Bisou5 has ripped and uploaded the pilot of the 1975 series Kate McShane, sourced from an unofficial DVD release. The pilot is now available on archive.org for all to view, so thank you for that Bisou! For years, we thought Mickey Mouse in Vietnam had been found. Well, turns out it wasn't completely found and it also wasn't only titled Mickey Mouse in Vietnam. VHS archivist CDCB2 found a copy of the full short with its original soundtrack and opening/closing titles on a tape his friend sent him, and has graciously uploaded it! From this, we can see that the original title appears to be Short Subject. Thank you so much for finding what we didn't even think existed! A raw copy of the clip can be found here. Last but not least, after many months of dedicated searching for it, LMW user DaKoolDood finally found the lost South Park game for Game Boy Color! As the game was never released, this ROM comes from one of the developers, David Theodore, who still had a copy and shared it with him. Big thanks to DaKoolDood for his efforts in finding it, and to David Theodore for sharing it with him! One last thing I want to mention, as less of a find and more of an update: two Osamu Tezuka films we have articles relating to, A Thousand and One Nights and Cleopatra (both articles NSFW), have been reissued on DVD and Blu-Ray by distributor Third Window Films as part of their Animerama series. Unfortunately, this only includes the original Japanese-language versions with subtitles, leaving the former’s English dub lost and the latter’s English dub existence-unconfirmed. Still, definitely check out the release if you’re interested in these films. That’s all for this time, I have to get back to my billion dollar mansion with my 17 Ferraris and eat caviar or something 😎😎😎😎. See you next time! Ace Ventura: Pet Detective episode "Circus Ace"
Ace Ventura: Pet Detective episode "The Cat Who Paints"
Pixar's Made in Point Richmond DVD has been found! The infamously hard to find DVD (a collection of rare Pixar animations that was never officially released, but rather given to Pixar employees as a gift in 2001) showed up online last month courtesy of LMW user jaret35 (aka ayeayematey), in the form of an encrypted iso (a decrypted version has since been made by contributor TOMYSSHADOW and can be found here on MEGA, or here on Google Drive)! If isos aren't your thing, you can start streaming via the above embed (the first video in a playlist of the DVD's contents, via YouTuber The Collective Animation Archive). Big thanks to jaret35 for the provision of the iso and to both TOMYSSHADOW and The Collective Animation Archive for making its contents more widely available! The 1997 Pokemon Gold & Silver Space World demo has been dumped online! Anonymously leaked on 4chan late last month, the ROM went on to make quite a splash in the world of Pokemon fandom (and the gaming world in general) due to it containing a large variety of unused/beta Pokemon; a video showcasing some of these Pokemon can be seen above courtesy of YouTuber TheJWittz (P.S. cheers for listing us as one of your references)! The ROM itself can be downloaded here via The Cutting Room Floor; big thanks to everyone involved in getting this piece of gaming history out to the public and making sure it's preserved for generations to come! Our good friend Bedhead Bernie has been hard at work on a mini-documentary about the troubled production of the unreleased 2009 3D animated film (once TV series) Freaky Flickers: Quest for the Golden Flicker and as of today the documentary is available for viewing via his YouTube channel! You can catch it via the above embed; be sure to give a like and a sub to Bedhead Bernie for more content like this, it would have taken copious amounts of time and original research to put this together and the whole story is surprisingly engaging, despite the nature of the film in question (and you might even hear a familiar voice or two). Great work, Bernie and co.! P.S. You can catch the script for the original TV pilot episode here. If you've been keeping up with Socks the Cat Rocks the Hill news, you'll no doubt know that the once-lost 90s game featuring none other than Bill Clinton's late cat Socks recently received a limited revival in the form of crowdfunded reproduction carts. Well now, the ROM has finally hit the internet, for those who do not have any other means of playing it! The ROM can be downloaded here, courtesy of OLDSKOOL; thanks! Two more episodes of the animated Ace Ventura: Pet Detective series have been found! The episodes "Circus Ace" and "The Cat Who Paints" were last month emailed to The Lost Cartoons Archive by a man named Dan Vzare, allegedly sourced from a now-defunct torrent site, years ago. You can catch "Circus Ace" and "The Cat Who Paints" above via The Lost Cartoons Archive's YouTube channel; big thanks to Dan Vzare and The Lost Cartoons Archive for the provision of these rare installments! In one more quick piece of gaming news, the once-free 2006 educational game NanoQuest has been recovered! The last known working executable of the game (originally a free to download title) was recently acquired by the folks at Twitch channel Gatorbox and has been shared online by them as of earlier this month! You can download it here; thanks Gatorbox! That's a wrap for this notice board, was there anything big I missed? If so, hit me up on either the LMW forums or Discord and I'll make some amendments. Take it easy! The lost pilot of Hi Hi Puffy AmiYumi was found by vimeo user Lincar Rox and can be viewed in the embedded video above! The first episode of the Live-Action Cybersix series was found by Beldam.D and can be viewed in the embedded video above. The tape that was a sequel to the Kazoo Kid tape was found by youtube user Special Friend and can be viewed above! An E3 demo of the Dreamcast survival horror game, Agartha. was found by an unknown user. This file can be downloaded here! A TV spot for the French Children's show Zappe! Zappeur was found by youtube user YoupiLa5animation and can be viewed above! An episode of Lamb Chop's Play-Along was found by user Obsolete Collector and can be viewed here! The LEGO game BIONICLE: The Legend of Mata Nui was found and uploaded by someone under the moniker JuniorMasterBuilder, the game can be downloaded here! All 13 episodes of the British television series Planet Ajay were found by twitter user bleebleaker and can all be viewed here! The educational writing game for PC called the Secret Writer's Society was found by librarian Phil Salvador and can be downloaded on the web archive here! Artwork for the C. Martin Croker series that went unproduced titled The Hy Angst Show was found by user RSTVideo (that's me!) and can all be seen on the article itself. That's all for now and let's hope for a more focused LMW! Have nice days everyone reading this! Dean Alioto's UFO Abduction (aka The McPherson Tape) has received an official re-release! Now available in its digitally remastered form (on DVD or downloadable copy), the notoriously eerie found footage mockumentary can be purchased via it's official website, ufoabductionmovie.com and the DVD also contains the Fox Encounters special on the film! I would highly encourage anyone who is a fan of this film, or of "lost" films in general, to grab a copy of this; I have already purchased mine because I am a big believer in supporting artists when they put their lost content out legitimately, and I would like to think that most of you would feel the same way and would also show support. Thanks to Dean Alioto for letting me know about the release (and also for signing my copy :D)! Randy has released 3 new episodes of the Lost Media Chronicles! This time he covers Winsor McCay, Souvlaki by Slowdive (in a crossover episode with Adventures in Vinyl Land) and Blue's Clues, respectively; check 'em out via the above embeds, there's nearly an hour of entertainment here! There are two people that, without whom this wouldn't have been possible, and those people are Anton (the highly talented MediaWiki pro on Upwork who put everything together for me and who has been more than helpful with ideas and in getting the wiki up to the standard I envisioned for this new iteration) and Commander Santa (whose hugely generous $1,000 donation following the uncovering of Clock Man was used and will continue to be used to finance these upgrades), I can't thank you two enough, I am absolutely blown away by the results and I think most users would agree that its a vast improvement over the old version. Special thanks to Reynard for the new logos! That's it for now, if you come across any bugs or anomalies with the new skin/upgrades (like I said, it does still require a small amount of work) please let either myself or another staff member know; thanks guys, catch ya's next time! A familiar face returns to the Lost Media Chronicles with a new episode! In this instalment, Trey covers the topic of the highly sought-after lost content from Thomas and the Magic Railroad; check it out via the above embed (and while you're there, give Randy and his team a thumbs up and a subscribe if you haven't already, they work hard on these videos)! The Johnny Kemp Reading Rainbow theme has been found! The video, found just under a week ago by YouTuber Drew Trachier can be seen above, albeit in low, handheld quality; still, it's much better than nothing! Thanks Drew! Here's hoping a higher quality version surfaces at some point. The last 48 minutes of the Nickelodeon Studios Opening. The full pilot of Penguins Behind Bars. Welcome to Pooh Corner episode "Rabbit Learns To Share". Howdy folks, and happy New Year! Sorry for the lack of a standard notice board post, the finding of Clock Man was kind of a shock for all of us and it took some time to get over it (and yes, Commander Santa has confirmed that it is indeed the same short he originally saw, so there's even more reason to celebrate). Clock Man isn’t the only exciting thing that’s happened recently though. In addition to a load of new finds (that I’ll get to in a second), dycaite’s been working with a MediaWiki professional to make a lot of improvements to the site itself. Just to name a few, we now have an SSL certificate for improved security, the site’s code has been changed to make the layout look better on mobile devices and lower resolutions, and we’re currently in the process of switching over to a more stable and less bug-ridden extension for article comments (that’s why comments are disabled at the moment, for more info on that, see here). There are going to be more of these changes coming in the near future, so don’t be surprised when they happen and be sure to thank dycaite! Several of the previously lost Aardman advertisements have surfaced, including the Weetos Moon Landing ad, the Bonduelle 'Salat Snak' ad, and their ad for Kellogg’s Mini-Wheats. Thanks to all respective uploaders! Not one we had an article for, but a 1915 short comedy titled The Awful Adventures of an Aviator has turned up after being presumed lost! Big thanks to Shane Fleming for transferring it and sharing it to YouTube! Back in August, a user named TigerPig Studios shared a trailer for the Marvelous Misadventures of Flapjack which contains some footage from the series’ elusive pilot! Another episode of MC Hammer’s animated series Hammerman has turned up – “Nobody’s Perfect”, uploaded by YouTube user areyoustilllistening (see above). Big thanks for that! The alternate vinyl mix of The Moody Blues’ album "Days of Future Passed" has been officially reissued in the deluxe edition CD of the album made for its 50th anniversary. You can buy it here! After years of only existing in transcript form, footage of Gilbert Gottfried’s infamous 9/11 joke has finally been released in the 2017 documentary Gilbert. Don’t know whether that’s a good thing or not, but you can view the footage here. As it turns out, the long-lost 1931 found-footage film Ingagi… isn’t actually lost at all! There aren’t any release plans yet, but rest assured, three prints of the film are in the hands of the Library of Congress and won’t be lost again any time soon. The 1968 colorized/redrawn version of the Looney Tunes short "Fish Tales" has been uploaded to Myspleen by user ChupaX as part of their "Cartoon Control Room" series and subsequently mirrored to archive.org here for those who aren't on the site. Huge thanks for saving a piece of history! Several other pieces of advertising material have turned up, such as various Nick Jr. Face promos, Aardman's ad for the Britannia Building Society, and Teletoon's Fish bumper. Thanks to the respective uploaders! The final 48 minutes of the 1990 Nickelodeon Studios Opening Day Celebration have been uploaded to YouTube by user Chris Graves (seen above). While this still leaves roughly 80 minutes of the special unaccounted for, we now have nearly two-thirds of it with original commercials! An anonymous hero has ripped the 2003 Adult Swim pilot for Penguins Behind Bars (seen above) and shared it through Pan-Pizza's Tumblr page. This is a big find considering the pilot hasn't been shown since its initial airing in 2003, so thanks to whoever it was! Canadian channel Encore+ has begun officially releasing episodes from the first season of Mentors to their YouTube channel in high definition! The series had previously been almost entirely unavailable in any form, so this is a big development. As of writing this they've uploaded the first 8 episodes; you can view them here! A number of previously lost YouTube videos by Chadtronic have been recovered, including the first 4 episodes of his Pillow Talk Podcast and 10 of his old Oculus Rift videos. Thanks to LMW user morphzero for finding them and mirroring them to Archive.org! The end-credits version of Johnny Kemp's Reading Rainbow theme song rendition has turned up in a clip uploaded by CDCB2. While the opening sequence version is still missing, this is big news for anyone who had been looking for it. You can see it here. Caper in the Castro, thought to be the first LGBTQ-themed computer game ever made, has been found and uploaded to Archive.org (both the original version and the later censored version)! Huge thanks to those responsible for its recovery! Another episode of Welcome to Pooh Corner has been found: "Rabbit Learns to Share" (seen above). At the risk of sounding like a broken record, THANK YOU to Jon Gossard for uploading it! That wraps up all the new (and old) finds, but before I finish, I'd like to remind everyone that Randy and Amanda have released two new episodes of Lost Media Chronicles - one on the Dixie Chicks death threat letter and another on A Charlie Brown Christmas. You can watch them both above. That's all for this time (phew), so I'm gonna go cross "write a notice board post" off my bucket list. See you later!